The Professional Rodeo Cowboys Association claims, “Jeremy has one of the most impressive list of academic accomplishments in ProRodeo.” Once a small-town kid, Sparks is now a Hall of Fame bullfighter and published author. But he is more than a cowboy with a pen. He’s a husband, father, brother, small group facilitator, business leader, veteran, and a saved by grace Christian! Like you, Jeremy was created in the image of God, with a passion to find his way in this crazy world. Jeremy’s traveled many roads. Some were dead ends. And some led to a destiny that made his dreams come true. Soon after accepting Jesus Christ into his life, Sparks received a specific vision from God. At 14, God called Jeremy to be a rodeo bullfighter. He went on to become a professional bullfighter, entertaining fans and protecting cowboys around the world. At 36-years old, Jeremy became the youngest cowboy ever enshrined in the famous Cheyenne Frontier Days Rodeo Hall of Fame. 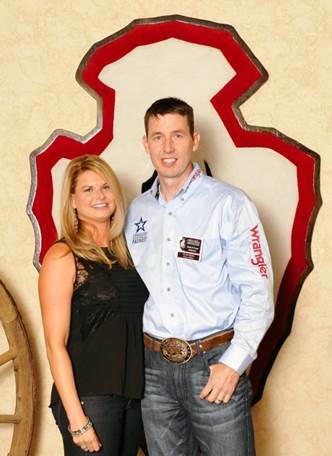 He earned his MBA, and served in the Air Force, where he was endorsed by the Pentagon as the “only professional bullfighter in the history of the USAF.” Jeremy continues to serve in the Air National Guard. Every scar tells a story and o' do he have both! So pull your hat down tight and get ready to grow. The 10 Principles That Guided His Cowboy Journey, will help you turn life experiences into a God-given perspective. Jeremy grew up a tiny town of 150 people; Fountain Hill, Arkansas. From 2004-2007, he operated the world’s most powerful weapon system; the Minuteman III Intercontinental Ballistic Missile. His oldest son lives in Hungary. Jeremy and Jamie have twin sons; Smiley and Mischief. He once went to China just to play hacky sack on the Great Wall. His traveling partner, R. Larry Lassister calls him Gerald Oliver West, or "G.O." for short. And you can too!